This movie is just amazing! Despite being, in some ways, a retelling of the original story, I can say that it's an improved DB's beginning, with all main characters (some with minor changes in their appearance, like Staff Officer Black and General White). Better renderized, it just became beautiful and gives joy to watch. The original magic got stronger with this special animation and it surely won't disappoint anyone who loves DB, and even the ones who had never watched it. Some characters were excluded, like Pilaf and his comrades, and some members from RR (Colonel Silver, Captain Yellow etc. ), but those were less important in the saga. What matters is that it shows us, in 75 minutes, all that happened before Piccolo Daimao's appearance. So, basically, the story goes from Goku meeting Bulma, Oolong, Yamcha, Puar and Master Roshi, to the complete defeat of the RR's army, with some small changes in the way it goes and the exclusion of Goku's training with Kuririn, as well as their first Tenkaichi Budoukai. Ending credits with "Dan Dan Kokoro Hikarete 'ku" as its background made me cry (this song really moves me). Any real fan of this incredible saga should watch it! Strongly recommended! Wow this anime has no reviews yet. I better add mine before someone else gets the first spot!! "The Path to Power" is the Dragon Ball 10th Anniversary movie that backtracks to the origin of the series, with apparently an "alternative take" on how Goku met up with his friends. If truth be told, I was pleasantly surprised by "The Path to Power". Unlike most of the other DB movies that I've seen, this one actually has a story. Yeah, you heard me right. The usual set up for Dragon Ball movies is this: Introduce some new villain(s) within the first 5 minutes that's out to take over the world... and then the rest of it is just a long drawn out battle between Goku and co with the aforementioned villain(s). At some point, Piccolo would make an "unexpected" appearance in order to save Gohan (Goku's son), then gets beaten up before Goku saves the day. The end. Surprisingly, this movie deviates from that much used formula. Shocking though it may seem, THIS movie actually has a story to tell, a story that can actually be considered a proper adventure, albeit one with lots of time spent battling enemies. However my point is there IS story development here and not just a simple 5 minute set up to face up to the newer, badder, stronger than ever enemy. This is what makes it so refreshing in comparison to the other Dragon Ball movies. The story itself is decent too, and kept me interested for most of the duration of the movie despite some parts being quite predictable. My main issue with this movie isn't actually with the quality of the content (my expectation wasn't exactly sky high in the first place), it's with the frequent fanservice. I'm not a fan of fanservice even during the best of times, but it's worse here because it's highly inappropriate considering the age group of the audience thats being targeted. Though "The Path to Power" still a way from being good, I'd definitely give it a thumbs up for good effort, and for succeeding to be one of the more interesting Dragon Ball movies. Extended edit: having watched the first Dragon Ball movie "Curse of the Blood Rubies", I'm even more impressed with "The Path to Power" now, because comparing the two movies revealed just how different this one is to its predecessor. It's not just a copy cat version of the original (which is a trap that remakes can easily fall into) - it came up with a completely different storyline that achieves the same aim and is by no means inferior to the old one. It's better than Curse of the Blood Rubies. I would never say this is worth watching over the actual series. Nor would I even really recommend watching it unless you were just curious. As a retelling, it really adds nothing to Dragon Ball. As far as a retelling goes this one is decent. The art and sound are more or less Dragon Ball. The animation feels a lot cleaner. Music sounds slightly better, but they did a good job of not straying too much in this aspect. Unlike Curse of the Blood Rubies you have the proper English voice actors too. The story is a weird mixture of the Pilaf arc and the Red Ribbon Arc. Sadly it cuts some of the best parts like the Tournament, Korin's Tower, and Pilaf himself. What you get isn't terrible. It's just a highly rushed mash up of what you got in the anime series. Do you need to see this movie? No. Is it worth your time? No. Is it the worst thing ever? No. 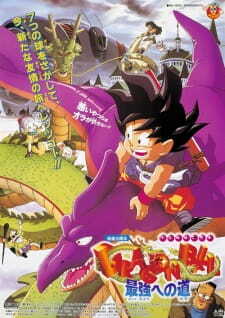 So if you love Dragon Ball and are curious/bored then give it a shot. To preface: I watched the Funimation Dub. For starters, Sikyou e no Michi is noncanon and sorta mashes the first bits of Dragon Ball with the Red Ribbon arc. It spends a lot of time on the former and not so much on the latter, ending with an awkward blend of disjointed scenes that aren't all that engaging or interesting. Now, that last comment is extremely relative, I understand that. How engaged someone is depends on, quite literally, their knowledge of the source material. I couldn't find myself enjoying it all that much because the source material was being butchered in favor of telling an alternate world Dragon Ball. However, the aspects within this film are just other-worldly enough to make someone keep going back and forth between what we already know about Dragon Ball and what this film is translating. For instance, the first time Goku uses a Kamehame wave he ends up using far more power than he initially would. In the manga it's big but not DBZ Super Saiyan tier. In this, Goku seems to already be able to make a big enough wave that a fleet of ships are destroyed. It's really strange and sort of off-sets the film especially in the last bit where Goku has some trouble during the last fight. But, things get way out of hand during this scene when almost becomes Super Saiyan? It's weird. It makes the whole thing memorable for all the wrong reasons. With story aside, it's a shame to realize that the animation here is pretty solid. I found some set-pieces to be really beautiful and certain combat sequences to be well animated despite their lack of depth or martial arts. That said, I can't say the film doesn't LOOK GOOD. Forgettable music. Can't remember a single song used during the film, neither any prominent sound effects that humbled me, something that should regularly happen when people are shooting lasers from their fingertips or punching the tar out of each other. I want to be wowed by what's going on not just with visuals but with audio. I didn't get this at all. VA work was good, though. Again, not that great. Since Goku's character is spent laughing too much (to the point of utter annoyance) or being horribly unrealistic within the world of Dragon Ball, we're left with the supporting cast being nothing but basic type-casts that don't get very much to go on. Granted, it's not until later on in Dragon Ball when the characters begin to really develop beyond caricatures but it'd still be nice to get some development. I can't tell you one thing about each character when I exclude what I already know from the manga. It's disappointing. Unenjoyable. For me, at least. The fanservice didn't help. I know early Dragon Ball has a couple scenes here and there but some of the additional stuff in this film was a little stupid. Some camera angles were so stupid, like... really stupid. Good for rewatching dragon ball?